Anyone who ever visited the Netherlands in November or December will undoubtedly have seen the large amount of street vendors selling oliebollen. 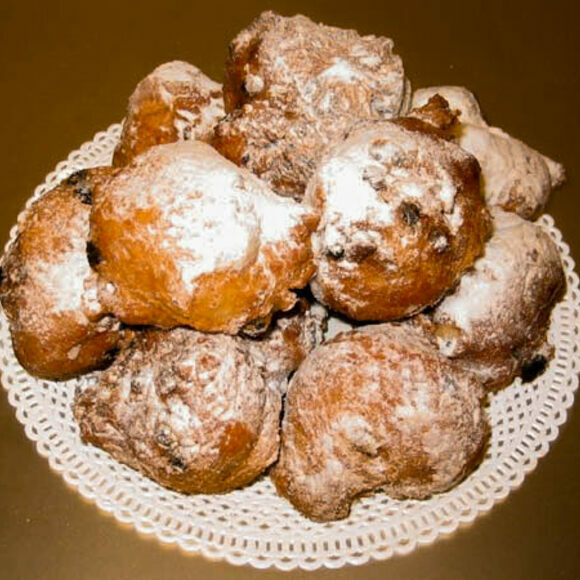 These balls of deep-fried dough are filled with raisins or chocolate and covered in powdered sugar. The oliebol is a traditional Dutch New Year’s treat. Though the name’s literal translation, “oil ball,” might not sound particularly alluring or festive, they make ideal crispy, satisfying sweets in the colder months. The oliebol, and the art of making it, are taken quite seriously and can occasionally spark friendly competition: Since 1993, the Dutch newspaper Algemeen Dagblad has held the Oliebollentest, an annual contest where editors comb the country looking for the year’s best oliebollen baker. The winner gets bragging rights, and a steady stream of customers. Although they’re consumed most widely between the end of Christmas and early January, bakeries start selling the beloved pastries in early November. You can also find them in Belgium. Every winter, trucks line up to serve these hot and greasy doughnuts. Make sure you eat them right where you stand. They harden and lose their charm quickly. But eaten at the right moment, they are unstoppable. Every December, Sinterklaas and his helper throw these little spiced cookies to Dutch children. The Netherlands' most famous treat now comes in a bottle. After the birth of a child, Dutch families celebrate with a sweet and colorful treat. Bakers fold this Polish pastry 81 times into the shape of a horseshoe. No rodents were harmed in the making of this fried Canadian treat.